We chose the uncompromising Intel Core i7-6950X processor for our new LPC. Here’s why. We’ve really outdone ourselves this time. A few weeks ago we announced the components we’d be stuffing into our new 2016 Large Pixel Collider. In order to make sure we created the most glorious system the PC Gamer offices have ever seen, we had to start out with an amazing CPU for the heart of the build. And with requirements reaching well beyond top tier gaming performance, the natural choice for the LPC was to go with Intel’s flagship Core i7 processor. Equipped with 10 blazing fast cores and Turbo Boost technology up to 4.0 GHz out of the box, the Core i7 6950X ensures we’ll be able to game, encode video, record gameplay, stream and more without dropping a single precious frame. The Intel Core i7-6950X processor has 10 unlocked cores and ready for overclocking, so you can be sure we’re going to overclock the heck out of the LPC to achieve the maximum performance possible. It’s hard to believe the original LPC was built three years ago since it’s still one of the top performing systems in the office and is used daily in our benchmarking, but it’s a testament to its power. As much fun as we’re having building another one of these behemoths, the 2016 LPC has to be totally future proof and ready for the most strenuous testing. The i7 6950X processor helps us accomplish this with one of our favorite features, hyperthreading. A feature of 7th Gen Intel Core processor family, hyperthreading allows the processor to run multiple threads per core, completing parallel tasks much more efficiently. This is especially important since the LPC will be constantly mega-tasking with full HD gaming, livestreaming, video recording and more taking place simultaneously. DirectX 12 games are also just around the corner, meaning future titles will be able to better utilize the 6950X processor’s 10 cores and hyperthreading. Tons of PC gamers believe the graphics card to be the most important piece of their PC, and in many times it may be. But for the LPC which is going to be filled to the brim with the best components imaginable, the Core i7 6950X processor is the centerpiece of it all. With support for a maximum of 40 PCIe lanes, this is the ideal CPU to give us the bandwidth to run two Nvidia GTX Titan Xs and two Intel 750 Series PCIe NVMe 1.2TB SSDs without any compromises in speed. 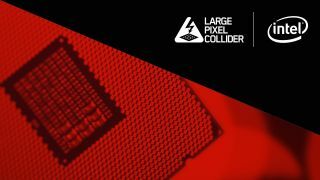 The original Large Pixel Collider was one of our proudest moments here at PC Gamer, but it’s finally time for a new beast to take up the mantle. We’re really aiming to outdo ourselves with the new LPC this year, so choosing an awesome CPU is just the beginning for our glorious adventure. Warning: Altering PC clock or memory frequency and/or voltage may (i) reduce system stability and use life of the system, memory and processor; (ii) cause the processor and other system components to fail; (iii) cause reductions in system performance; (iv) cause additional heat or other damage; and (v) affect system data integrity. Intel assumes no responsibility that the memory, included if used with altered clock frequencies and/or voltages, will be fit for any particular purpose. Check with memory manufacturer for warranty and additional details.